On Wednesday, I shared trade secrets with Nancy Yang, CEO of Asia Charity Services, a Hong Kong NGO that engages business professionals in skilled volunteering assignments focused on strategic planning and board development for Asian NGOs. Nancy decided to capstone a successful career in management consulting by launching Asia Charity Services in 2007. We spent a lot of time talking about how we evaluate the outcomes of our volunteer consulting assignments. One might think that two similar organizations might be guarded in sharing their “secret sauce” recipes, but there was none of that in this conversation. The way I see it, if we want to see skills-based volunteering become a norm within corporations, NGOs and social enterprises, there have to be many like-minded individuals and organizations pursuing this breakthrough. Later in the week, Grameen Foundation gathered together a group of long-time supporters to share its strategy in Asia for the next three years. It was encouraging to see the network of corporate and individual support that Jennifer Meehan – Grameen Foundation’s Executive Vice President for Solutions and Regions, and Regional CEO for Asia – has built in Hong Kong, and how these supporters are bringing new folks into the fold. 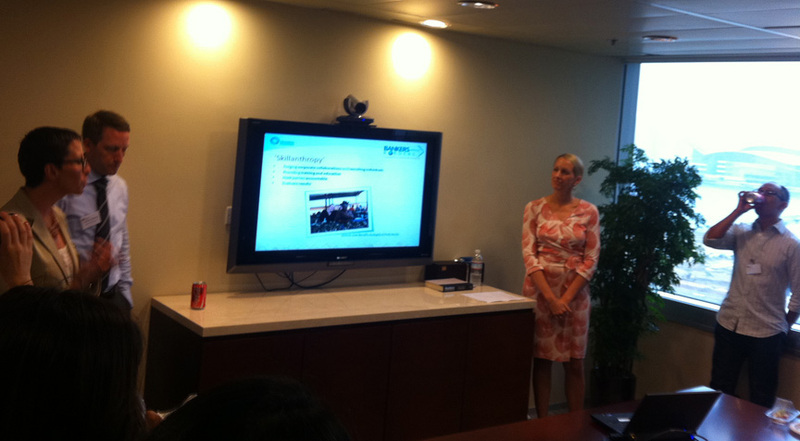 That evening, Bankers without Borders hosted its first live event in Hong Kong for local volunteers. Hallelujah, they showed up! It was great to see some familiar faces – Cristina Rueda (one of the leaders of the Grameen Foundation Shanghai volunteers I mentioned previously) was in town and stopped by as she continues to volunteer with the Hong Kong team. And Jenny Mok, a risk-management specialist in Hong Kong, shared her own personal BwB story, which includes helping Child Finance (a local NGO) prototype standards for child-friendly financial products, and conducting risk-management assessments with two microfinance institutions in Peru. On Friday, I facilitated a virtual retreat with Grameen Foundation’s leadership in India, Indonesia and the Philippines, to talk about how skills-based volunteering could kick our efforts up another notch. As a provocative question, I asked the team, “If you, in your role, had at your disposal five to 10 volunteers who you could absolutely rely on to help you be successful at your job, what kinds of things would you delegate to them?” Besides creating a great list of tactical ways we could better use volunteers to support our own knowledge management, we saw a theme emerge: We are often so busy focusing on our immediate and urgent work that we are unable to devote time and energy to the longer-term, and often more important work – strategy, market research, analyzing and learning from our own experiences. Volunteers can be incredibly helpful in helping us keep an eye on what’s down the road and helping us to learn from the stretch of road on which we just drove. I wrapped up my week in Hong Kong feeling incredibly optimistic about Grameen Foundation’s work in Asia – and Bankers without Borders’ role in particular. It will be interesting to see how these disparate conversations and meetings weave their way together, as I am sure they will. Now, I am off to Nairobi to learn from similar stakeholder meetings in our offices there, and do my part to expand Bankers without Borders’ footprint in Sub-Saharan Africa. This entry was posted on June 21, 2012 at 12:00 pm and is filed under Asia, Bankers without Borders, Business, BwB-Import, China, Hong Kong, India, Indonesia, microfinance, Philanthropy, Philippines. You can follow any responses to this entry through the RSS 2.0 feed. You can leave a response, or trackback from your own site.